How many People can Watch Hulu at Once – To answer the question – How many screens hulu can be played Simultaneously and How many devices can you watch hulu on, We will start with different plans available with Hulu. If you are a movie buff and watch unlimited online movies and TV shows, then you might have definitely know about Hulu. Hulu is one of the top most On demand video streaming service and it offers you to stream through their huge catalogue of Movies and TV Shows. Hulu is the emerging player in the OTT and On-demand video streaming service. It is the best alternative to current global leaders in this space like Netflix, Sling TV, YouTube TV and Amazon Prime. Earlier Hulu is only a website which offers you to watch content on Web but it has expanded its services to Online Live TV now and became a good replacement to Cable TV. You don’t need to pay lumps of money for the Cable networks any more. Have a customised plan with required add-ons with Hulu and enjoy it on the big screen. Hulu offers you great content including few premium channels like HBO, EPSN and Kids channels. Hulu has reached 20 million subscribed user base recently. Hulu is available only in United States and Japan currently. They are now focused to grow in other regions as well. Hulu currently eyes on Skinner TV bundles to eliminated cable TV network and occupy that space. 1 How many devices can you watch Hulu on at once? 1.1 How Many People Can Watch Hulu At Once? Here you can get the comparison between Hulu and Sling TV – Hulu vs Sling TV Which is Better? But have you ever got this question? Is there any restriction on number of stream I can play with one hulu account? The answer is YES. There are certain restrictions imposed on number of simultaneous users you can have on a hulu account. Otherwise, one account would suffice to entire people. So let’s see How many devices and stream you can have with one hulu account at a time. Hulu offers you wide range of Movies and TV Shows library at reasonable cost. Hulu services are comparatively cheaper than Netflix (Scroll to the end for Hulu vs Netflix comparison). It has all the plans starting from basic to Premium one and Hulu Live TV offers you all the content along with Live TV. Number of simultaneous streams you can play with Hulu differs from plan to plan. Hence How many people can watch HULU at once is depending upon your plan. You will get access to Hulu Originals, TV Shows with all episodes, Super hit movies, Kids shows and many more with minimal advertisements. You can get first month free service with this plan. You can avail Add-Ons along with this standard plan. If you want to get rid of commercial advertisements, then you can opt-in for No Commercials Add On. Similarly you have add-ons for HBO, SHOWTIME, CINEMAX etc. You can switch plans or cancel this plan anytime. There is no add-on available for Unlimited Screen with the standard plan. With Hulu Live TV, you can stream through your favourite catalogue on your TV screen (Fire TV, Firestick, Apple TV, XBOX, Chromecast, Samsung, LG TV etc.). 50 + top channels in all categories like entertainment, sports, news, kids etc. available. You will also get ‘No Commercial’ plan with this. Only one week free access is available with Hulu with Live TV plan. You can avail Unlimited Screens Add-on with this plan and can watch Hulu on Multiple devices with multiple simultaneous streams. How many devices can you watch Hulu on at once? Simultaneous Streams – The number of simultaneous streams of content that you can access, including ‘in-home’ and ‘out-home’ streams, may vary by service and require device and account verification. ‘In-Home‘ streams are those that you stream through your home internet service. ‘Out-of-Home‘ streams are those that you stream through a connection to a cellular or WiFi network outside of your home. With the standard plan you can watch Hulu on only one device at once. But few users claim that they were able to Watch Hulu movies in two devices simultaneously without any technical issues. So we assume that they have given that provision in order to avoid stream issues while customer try to switch between devices. If you try stream in more than two devices at once, it will throw an error saying ‘You are streaming in multiple devices‘. So perfect answer to the question How many people can watch hulu at once is two. If you exceed more than two devices, then it will display an error message. However you can upgrade your plan to add unlimited screen add-on. We will let you know the steps to do that. Hulu supports most of the available devices. You can use your Hulu account to stream movies in following list of devices and players. Let’s rewind what we have discussed till this point. To answer this question precisely, it depends on the plan you have subscribed to. Here is the precise guide I found on Hulu help section. With Hulu On-demand services (standard plan with or without ads), to answer Number of people can watch Hulu simultaneously with one hulu account, You are allowed to watch one stream per account. This means, you can add as many supported devices you want, but you can’t play in more than once device at one time. If you want to stream through the another device you have, first you need to stop streaming in the first device. But as mentioned earlier, they’ll give you unofficial provision to stream in two devices per one account. If you have subscribed to Hulu with Live plan, you can watch videos in two devices at once. But you can always choose Unlimited Screens option add on to use Hulu services on multiple screens. So with this add on, you can enjoy Hulu services simultaneously in all hulu supported devices while you connect on your Home network. But while you connect to ‘Out of Home’ network, you can use it on only 3 mobile devices. You can add unlimited screen add-on with your hulu plan at $14.99 monthly subscription. Tap on Continue now to confirm your choice. So the best answer to the question – How many people can watch Hulu at once is – depending upon the plan you have subscribed to. NetFlix is a top player in Video on demand services. With already stable system and huge funding, they are ruling this space with great content. Netflix expanded to almost every region available on the earth. But Netflix subscription costs are bit expensive compared to other service providers like Hulu, Amazon Prime etc. So people are choosing other services over Netflix. 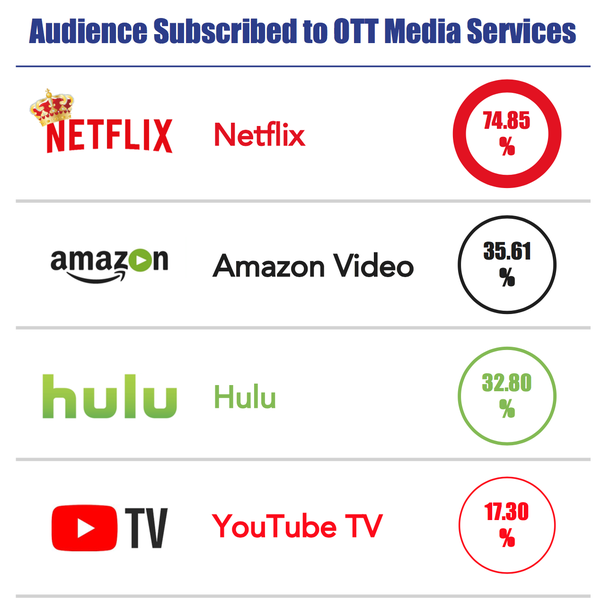 Here is the list of the OTT media services user base. NetFlix is still top on the list but other competitors are also emerging into the market with good amount of subscriptions. NetFlix premium plan costs $13.99 in US and you can watch Ultra HD content with this. But with Hulu, You need to pay $7.99 only per month (with ads). Hulu is bit cheaper than Netflix in this area. With standard Hulu plan, you can add many devices but allowed watch stream in only one device at once. If you have subscribed to Netflix $13.99 plan, you can watch streams up to 4 devices at once with Ultra HD Quality content. So if you wanted to stream in more than one device, go for NetFlix. More competitors are emerging into OTT Space with great content and with reasonable price. Amazon Prime recently came into this market but within the short span, it got 35.61% subscribers. Number of people using Hulu and Number of devices on Hulu has grown rapidly over the recent days. It has gained all these within short span of time with it’s stunning content at lower costs compared to cable networks. So when coming to How many people can watch Hulu at once, you can choose multiple screens ad-on with additional cost. So with this, I’m concluding this post on How many people can watch Hulu at once and How many devices can you watch Hulu on. If you still have any queries do let us know through the comment section. We will be glad to help you out. Cheers! info. I am satisfied that you simply shared this helpful information with us. Thanks for the article well I just watch your blog to get basic tech knowledge.You are doing a good work man.!!! !